As we get closer to the fall film festivals, let's take a first look at another film premiering this year. 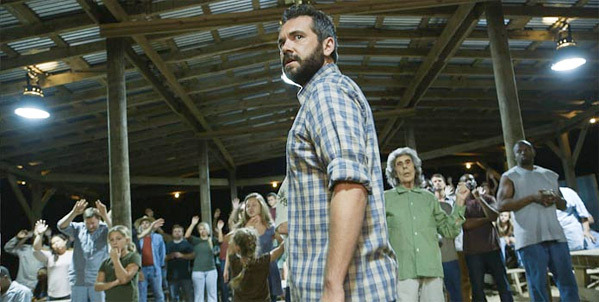 The latest film from indie genre icon Ti West (of The House of the Devil, The Innkeepers) sends a crew of Vice media correspondents on "a harrowing journey into madness and messianic bloodshed" in The Sacrament. The cast includes AJ Bowen, Amy Seimetz (from Upstream Color), filmmaker Joe Swanberg, Kate Lyn Sheil and Kentucker Audley. Documenting a search for a friend's missing sister, they end up traveling to "Eden Parish," a self-sustained "rural utopia" where things get a bit freaky, obviously. Take a look below. 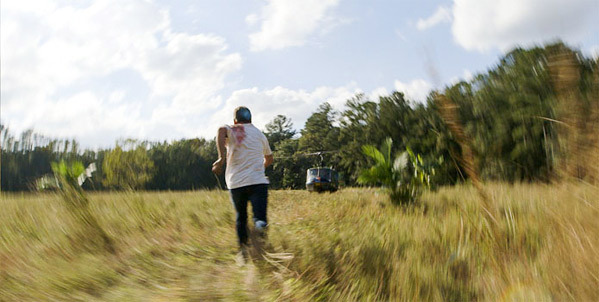 Here's the synopsis: From acclaimed writer/director Ti West (The House of the Devil, The Innkeepers) and horror master Eli Roth, The Sacrament follows two Vice media correspondents as they set out to document their friend's search to find his missing sister. They travel outside of the United States to an undisclosed location where they are welcomed into the world of "Eden Parish," a self-sustained rural utopia with nearly 200 members. At the centre of this small, religious, socialist community is a mysterious leader known only as "Father." As their friend reunites with his sister, it becomes apparent to the newcomers that this paradise may not be as it seems. The film is premiering at TIFF 2013 this September. We'll be catching it at the fest. Wow that first shot is quit unique. This will be good. Definitely has potential, but I hope its better than The Innkeepers. I was so disappointed by that one. I'm so obsessed with Ti West's films. SO basically it is a Jonestown situation? I have complete faith in West to do this right. Just watched it. Not good at all! Bad actors' performances. It does not convey the dramatic quality of the actual events ocurred in Jonestown, or the transformation of the leader's character, from charismatic to totalitarian. The real story's potential is really untapped. What movie did you watch? This was an outsiders point of view of what basically happened at Jonestown, not an insiders point of view. The acting wasn't supposed to be the best as it was in documentary style, not in movie style. The untapped part, is just that, this was well an truly tapped as it was an outsiders point of view and again not documented from one of the followers. So amazing what religion can do and how it is used. Just finished watching this Jonestown remake. It is scary to see the lives that are claimed time and time again by these "God" like cult leaders in real life.